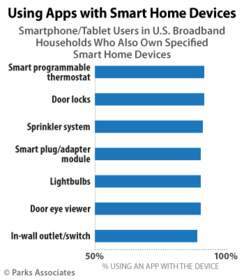 DALLAS, TX--(Marketwired - Feb 3, 2016) - Parks Associates today announced a new industry report, Cloud Platforms for the Internet of Things, revealing 19% of U.S. broadband households currently own at least one Internet-connected smart home device. These devices, including smart thermostats, sprinkler systems, door locks, and security cameras, offer remote control, monitoring, or notifications via a smartphone, tablet, or computer. Upwards of 90% of device owners use mobile apps to access cloud-supported services associated with their devices. "IoT cloud platforms offer device makers and companies the opportunity to greatly expand the value of a product or service, and consumers are responding," said Brad Russell, Research Analyst, Parks Associates. "Cloud-based services also create unique new service partnerships, such as the automated guest-entry system in the RemoteLock from smart door lock maker LockState. This solution will be integrated into Airbnb's new Host Assist program to extend the value of that part of the sharing economy." The report provides a case study of smart door lock maker LockState, presents business cases and market opportunities, and explores the decision points and business strategies involved in selecting a cloud platform provider for connected products, with implications for both device makers and cloud providers. "The innovations on display at CES® last month confirm 2016 will be the year the cloud matures into the default storage option in the IoT," Russell said. "IoT platform providers Zonoff and Ayla Networks announced an open cloud-to-cloud partnership that simplifies the process of adding connected products to smart home systems. Samsung showcased its Family Hub at CES, which included a smart fridge that displays its contents and can show users via smartphone which items are running low. A device maker's decision to build, buy, or partner for cloud services is a complicated one, but they are increasingly feeling the pressure to move into cloud services or risk losing market share." 67% of U.S. broadband households connect at least one smart TV, Blu-ray player, gaming console, DVR/PVR, or streaming media device to the Internet. 33% of U.S. broadband households own at least one digital healthcare device, with 6% of households owning three or more devices. 45% of car owners in U.S. broadband households that own a smartphone use the smartphone directly to access maps and navigation while driving. Cloud Platforms for the Internet of Things is available for purchase at www.parksassociates.com. To schedule an interview with Brad Russell or to request specific research data, contact Holly Sprague at hsprague@gmail.com, 720.987.6614.